For a free, no-obligation basement waterproofing quote, call or e-mail us today! We proudly serve Kelowna, Kamloops, Vernon, the surrounding areas of Penticton, Quesnel, Nelson, Williams Lake, West Kelowna, Salmon Arm, Castlegar, Westbank, Trail, Coldstream, Oyama, Armstrong, Chase, Winfield and many nearby areas. Disaster restoration experts are busiest during heavy rains -- so call them right away to beat the crowds. These companies generally provide 24-hour emergency servic -- call them as soon as you find a problem. Depending on your area, the local fire company may also be available to pump your basement out. Here's where we come in! If your home is located in the British Columbia area, we'll be standing by to help you. If you have photos, electronics, or irreplaceable items that have water damage, do not despair! Many disaster restoration companies have ways to restore your property and restore lost computer data. This is one of the key reasons to opt for them over a standard pump-out job from a plumber or fire department. Some insurance companies will offer protection from flooding, and some will not do so. Additionally, it is important to note that some companies offer coverage for failing plumbing and not floods that come from groundwater flooding. Before meeting with them, be sure to research each contractor you work with online -- and to check out their rating on the Better Business Bureau. You may also want to ask the contractor to provide good references and testimonials, and to ask if their workers are fully insured. When it comes to wet basement repair, we at BC Basement Systems have it down to a science. We'd like to meet with you and show you firsthand why we're the best in the business! For a free, no-obligation basement waterproofing quote, contact us by phone or e-mail today! 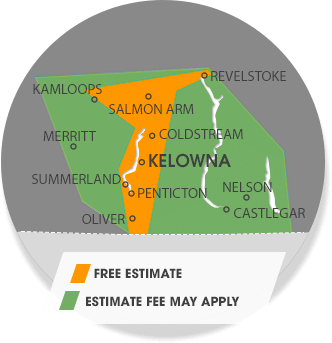 We proudly serve the British Columbia area, including Kamloops, Kelowna, Vernon, Westbank, Trail, Coldstream, Oyama, Armstrong, Chase, Winfield, Nelson, Quesnel, Penticton, West Kelowna, Salmon Arm, Castlegar, Williams Lake and nearby.